Wall relief at the entrance. God Anubis on the tomb's wall. Relief at the entrance to the tomb. Depiction of the king and the queen. Hieroglyphs on the tomb's wall. Beautiful wall paintings inside the tomb. Maya was the Treasurer of the Pharaohs Tatankhamun and Horemheb (18th Dynasty). His tomb was constructed between 1330 and 1310 BC. The wall relief of the inner courtyard and entrance gateway, which still preserve traces of paint, are of exceptional quality. The fact that the subterranean tomb-chambers also have relief decoration appears to be unique in Saqqara. Relief blocks and statues from the tomb of Maya can be seen at the Egyptian Museum in Cairo, the National Museum of Antiquities in Leiden and other museums around the world. The tomb of Maya was first noted by the German Egyptologist Lepsius in 1843. It was excavated in 1987-1991 by a joint expedition of the Egypt Exploration Society in London and the National Museum of Antiquities in Leiden. For their protection, the decorated underground chambers of the tomb were dismantled in 1995 and reconstructed below the ground level of the outer courtyard which had been left unfinished at Maya's death. The pylon and entrance gateway were also reconstructed at this time. This is the most yellow tomb I have ever seen! all wall paintings and decorations are made in yellow colour, so impressive. 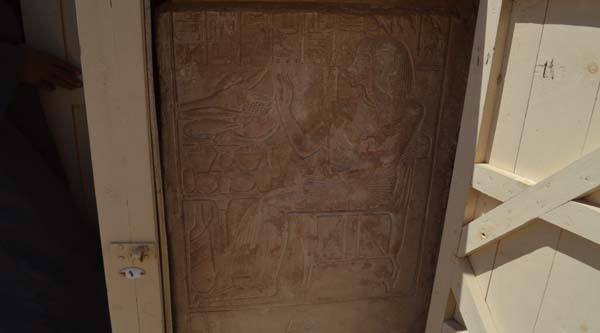 So happy that got a chance to get inside this beautifully decorated tomb in Saqqara.